Pozole rojo is a hearty classic Mexican soup or stew, traditionally made with pork broth, pork, hominy, and spices, then topped with garnishes such as lime juice, radishes, onion, lettuce and more. It’s a popular traditional dish served throughout the country that is representative of Mexican cuisine. This post is part of a compensated campaign with Teasdale Foods. All opinions and the recipe here are my own. I admit that pozole can be an intimidating dish to make at home, mostly because making the perfect pork broth can be tough to match when you’re up against the memory of a beloved family member’s recipe. 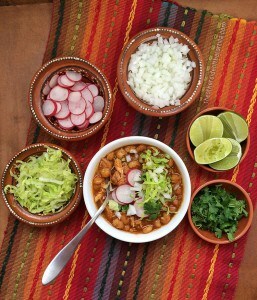 But I’ve found an awesome semi-homemade cheat for pozole that’s simple to prepare and easy to love! I’ve used Teasdale’s new Easy Prep Spicy Red Pozole in this recipe, which is basically just cheating at the broth and hominy preparation—the two factors that often scare people away from making this traditional dish at home if they don’t have a trusted family recipe. What’s great about it also is that you can choose what kind of meat you want to add; I’ve chosen boneless country pork ribs because they’re easy to find, usually have a mix of dark and light meat, and they cook to tender perfection in a slow-cooker. Nothing beats low and slow, especially when there’s minimal effort involved. The majority of the prep time for this recipe is for slicing and dicing your garnishes. I’ve also doctored the pozole to my personal taste by cooking the pork with bay leaves and Mexican oregano, and adding more chiles to the broth. The slow-cooker also means that most of the cooking is hands-off so you can be doing something else! Pozole is a prehispanic dish that has been enjoyed in Mexico for many generations dating at least all the way back to the times of Moctezuma in the latter part of the 1400s, and the preparation still used and served today goes back to the 18th Century, according to culinary historians. The three main types of pozole you’ll find all throughout Mexico are pozole blanco, pozole verde and pozole rojo. In Mexico City, where our family is from, you can find many varieties of the three typical colors of pozole served all over the city, including more than a dozen regional varieties from all over the country. And, they can have pork, chicken, shrimp, or be vegetarian-friendly, too. 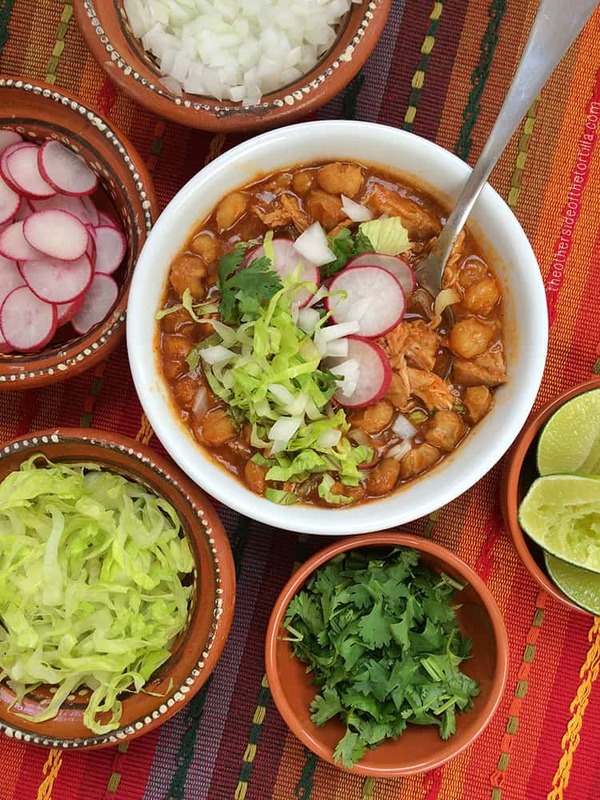 You can find pozole served everywhere from dedicated pozolerías to markets, fondas and even some high-end restaurants that serve traditional Mexican cuisine. sliced radishes, diced white onion, shredded iceberg lettuce or cabbage, chopped cilantro, fresh limes, dried Mexican oregano and chile powder, such as ground chile piquin. In Mexico City, it’s very common to serve pozole with tostadas with crema mexicana spread on top, which is to be eaten alternating with a spoonful of pozole, then a bite of tostada. This recipe is most similar to Jalisco-style red pozole, and I’ve added a few extra ancho chiles to the broth for a deeper chile flavor. I like my red pozole fairly spicy, but you can leave them out if you’re not accustomed to spicy pozole. But if you do want to incorporate more heat, you can also puree the extra chiles with a little broth once hydrated, then strain them into the soup, or just add a sprinkle of ground chile piquin when serving. Take care not to overcook the hominy, as it can become mushy. (When in doubt, you can always remove the hominy a little early and put it on the side while your broth is still cooking in the slow-cooker. You’ll know the hominy is done when it looked bloomed or fluffy.) Pozole reheats well and can also be frozen. If the broth is thicker than you’d like, you can also thin it out with a bit of chicken broth. Do you like pozole rojo or pozole blanco better? Let me know why in the comments! Pozole rojo is a classic Mexican soup or stew, traditionally made with pork broth, pork, hominy, and spices, then topped with garnishes such as lime juice, radishes, onion, lettuce and more. 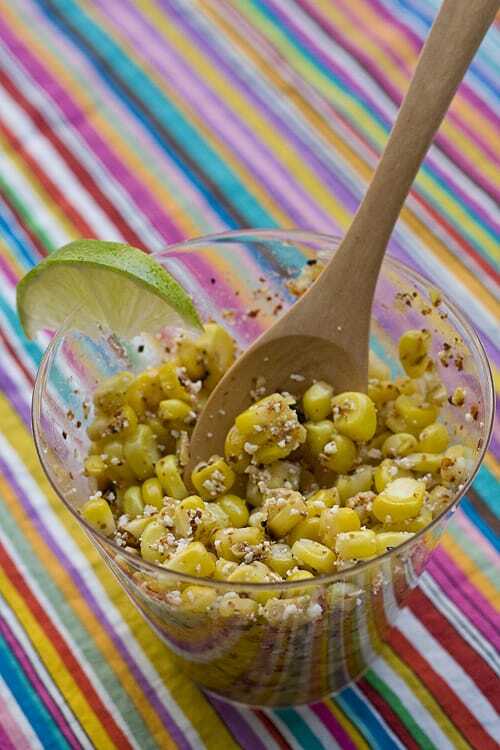 It's a popular traditional dish served throughout the country that is representative of Mexican cuisine. Place the bay leaf or leaves on the bottom of the slow cooker. Arrange the boneless country pork ribs on their sides, covering up the bay leaf, and cover the bottom of the slow cooker. Sprinkle kosher salt and Mexican oregano over the meat. Cover the slow cooker and turn on low heat. Cook for 2 hours, turn meat, and cook for 1 more hour. After the third hour, open the can of Teasdale Easy Prep and pour the liquid in first. Spoon the hominy over the top and even out so everything is covered by broth. Turn slow cooker to high heat and cook for 1.5 to 2 hours, until the broth comes to a boil. Remove lid, turn off heat (or turn slow cooker to keep warm setting) and ladle into bowls. Garnish with a squeeze of lime juice, sliced radishes, shredded iceberg lettuce or cabbage, diced white onion, chopped cilantro, and a sprinkle of Mexican oregano and ground chile piquin or ancho (optional). Serve with tostadas and crema mexicana.